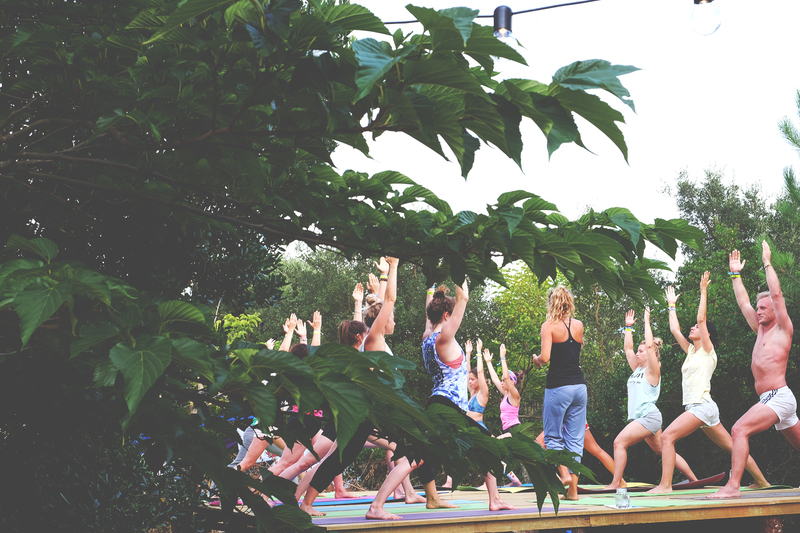 Join us in our Moliets DELUXE for a week of surfing & fantastic sunset Yoga sessions in our most beautiful bohemian bell tents! A short walk to the beach with consistently good waves. Cool social environment, surf and make friends along the way! Payment & Cancellation Policy Reservation Deposit required. | Due Balance amount to pay 30 working days prior to arrival. | For cancellations more than 30 days before arrival all funds received will be fully refunded less transaction fees. | For cancellations less than 30 days before arrival, no refund is possible however we will do our best to credit travel to a later date depending on availability. | Any changes on travelling dates will be accepted depending on remaining availability. All rooms with private bathroom? Toilet blocks on site. All the Moliets area is popular for being suitable for all surf levels due to its endless beaches, scattered beach breaks and great weather. Moliets is situated in the south west of France, neighbouring the Basque country and Northern Spain. It’s also very close to Hossegor, which hosts one of the world’s largest professional surf competitions. Moliets Surf Camp is a camping site located in a big pine forest, providing its guest enough shadow on hot summer days. You directly enter the big beautiful beach from the campsite or take a walk and explore the lively and colorful beach promenade, where you will find a range of amazing restaurants, pizzerias, ice cream parlors, surf shops and other amusements. 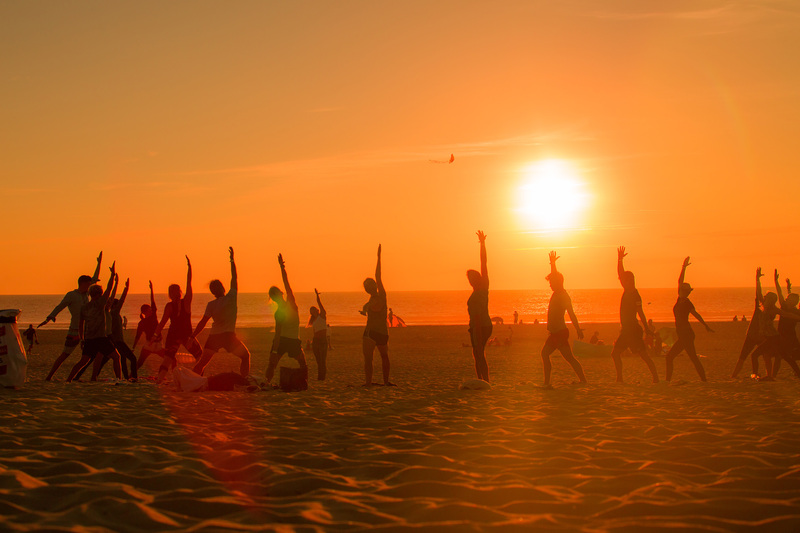 Besides all this, you’re in France with great food and summer beach parties! 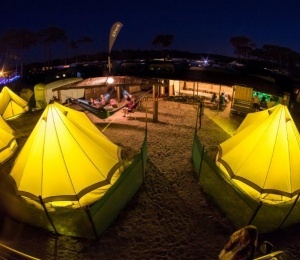 You might also like to hit the famous bars "L'open" and "Meltin" which are popular for its great parties and where campers, guest, surf instructors and surfers from all over the world will come together to have a couple of drinks while listening to live bands and party until the early morning hours. Moliets has the most genuine surf spirit that you’ve been looking for. No doubt a great choice if you want to surf and party in France. 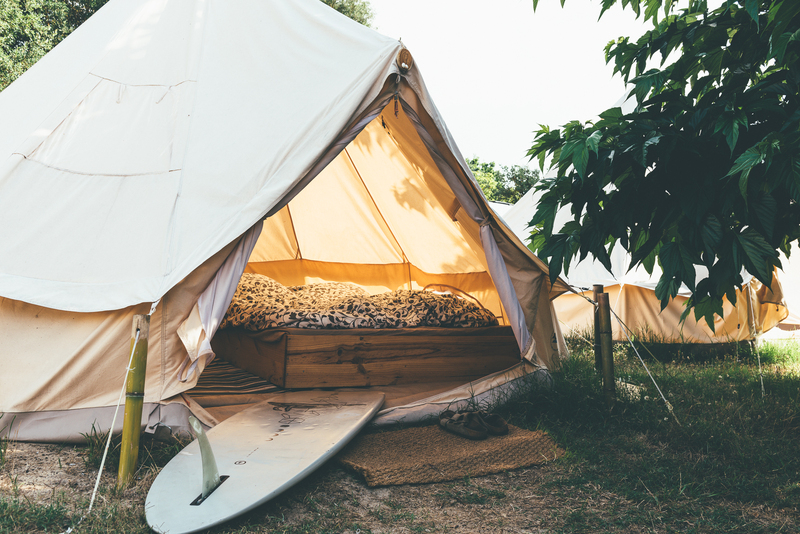 This is a real surf camp! Amazing surf spirit all day long in the middle of a pine tree forest overlooking the Atlantic Ocean! 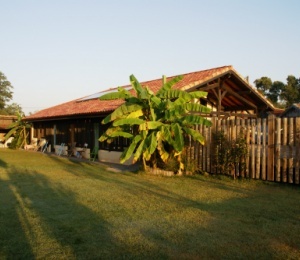 Our surf camp is located in Moliets Plage, southwest coast of France, north of Hossegor. 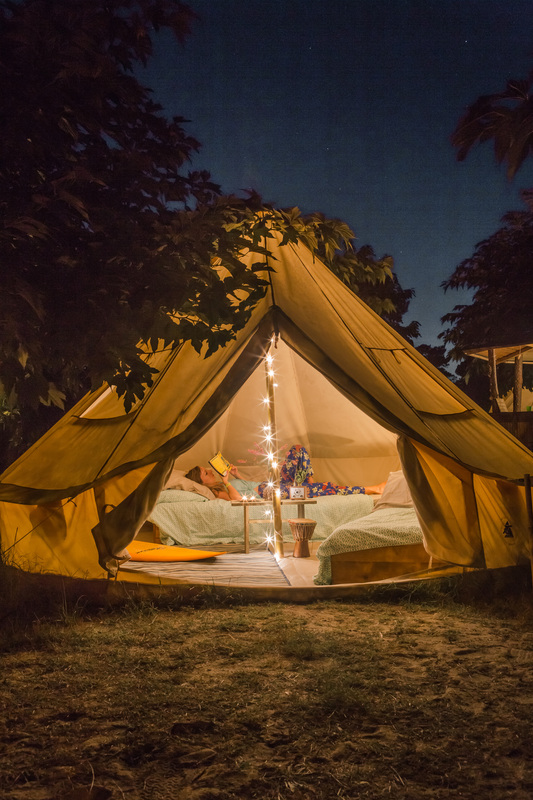 Moliets Surf Camp provides new and wonderful bell tents offering accommodation for couples and singles. 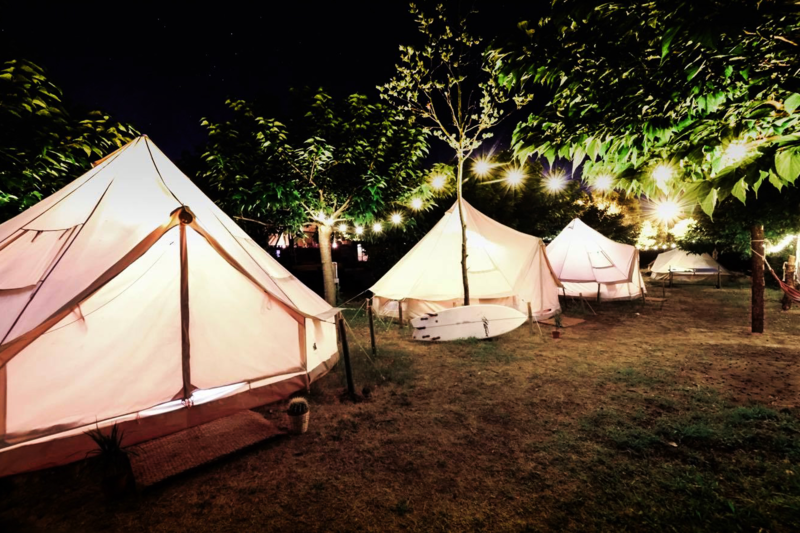 Tents for couples are large Tipi-Tents with a double bed, large enough to store all your belongings. 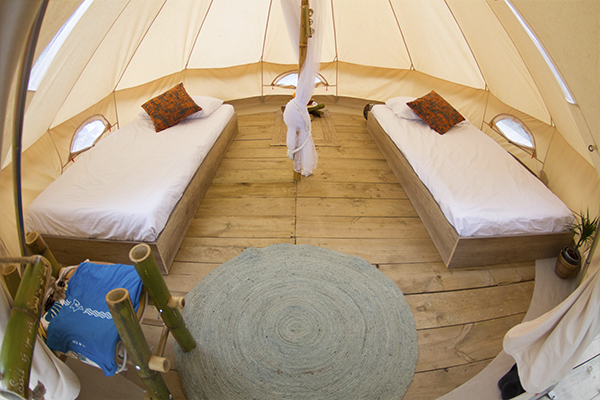 We also offer sharing accommodation on our large Tipi-Tents with individual and comfortable memory-foam mattresses. 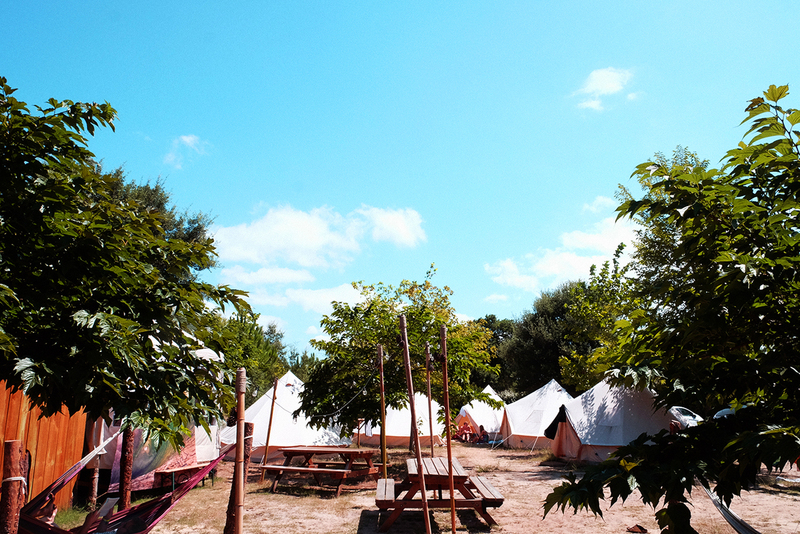 Large mattresses are provided in all our tents but we recommend bringing your own sleeping bag/sheets and pillow. 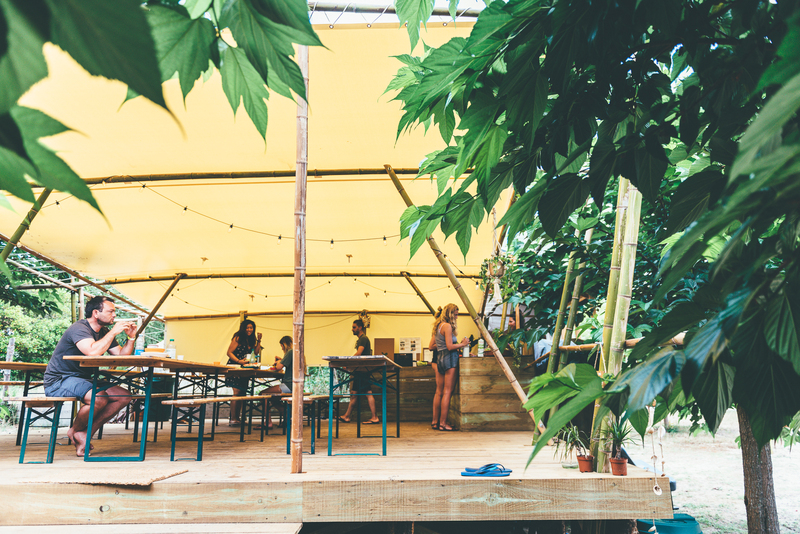 Outside we have a large shaded eating area, a skate ramp, a brand new three-tier outdoor cinema, several chillout areas with hammocks and sun beds. 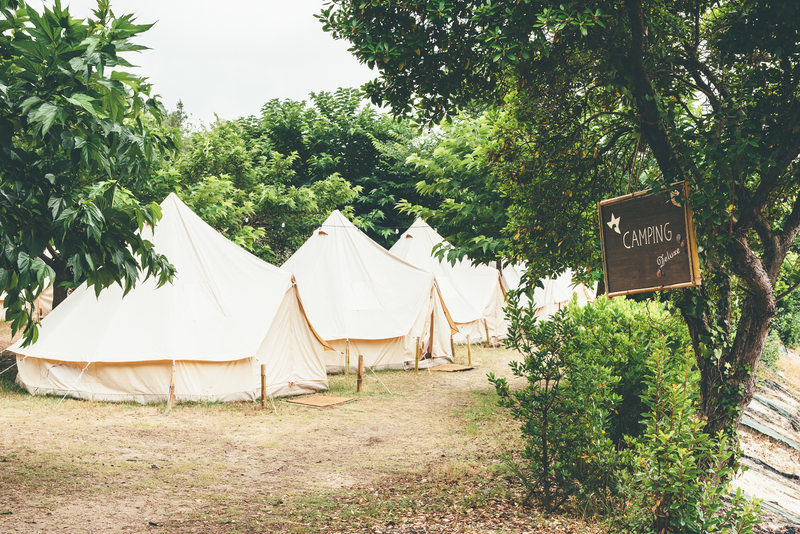 The camp is fully equipped with hot shower and toilet facilities, WiFi, mountain bikes at your disposal, all sorts of sports courts and much more. 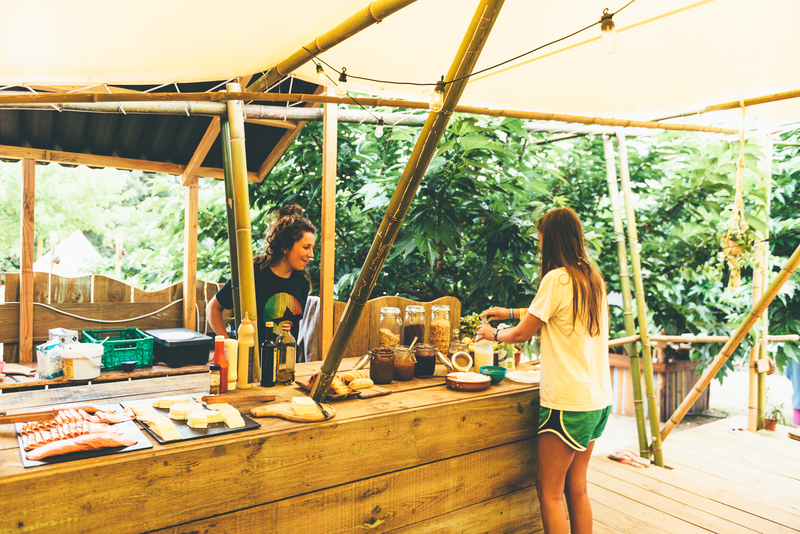 Full board pack is also available and includes a large breakfast buffet, a lunch picnic that you can prepare yourself at the breakfast table and a healthy warm evening meal cooked by the in-house chef with everything you need after a day of surfing. Once a week the chef has an evening off, so breakfast and lunch is still provided but in the evening you can explore the local restaurants, pizzerias and cafe’s. 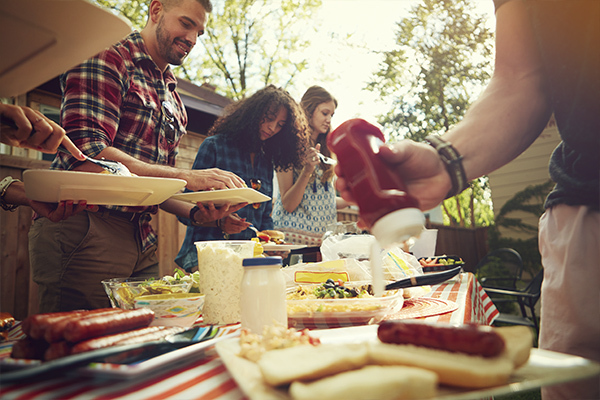 There is a large BBQ area where guests are welcome to use if they wish to cook themselves. 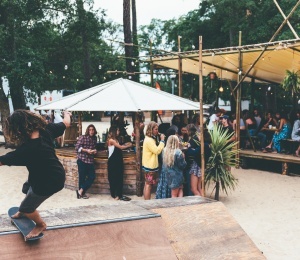 Moliets Surf Camp is situated just 20 minutes from Hossegor, a world renowned surf spot with plenty of bars, nightclubs, restaurants, surf shops and a thriving street arts and entertainment scene for you to explore. 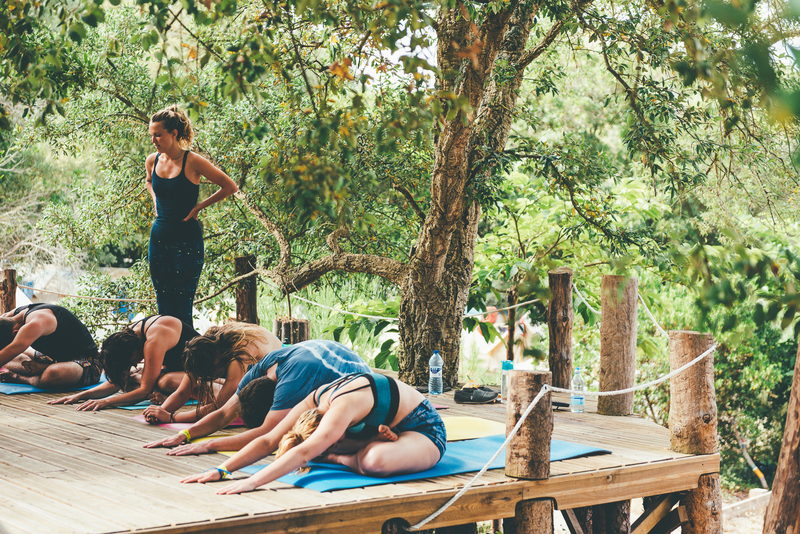 This is one of the most recommended surf camp for 18-30s. Please let us know when booking with us, if you have any kind of allergies or eating preferences, like a vegetarian menu. Moliets is perfect for all surf levels due to a big amount of scattered surf spots and a great weather. Many of the sandbanks may change but the Huchet River mouth is always there with some nice lower tide beach-breaks. Just a couple minutes walking from the surfcamp you find top beach breaks along a big stretch of sand. There’s always a spot guaranteed with no crowd. 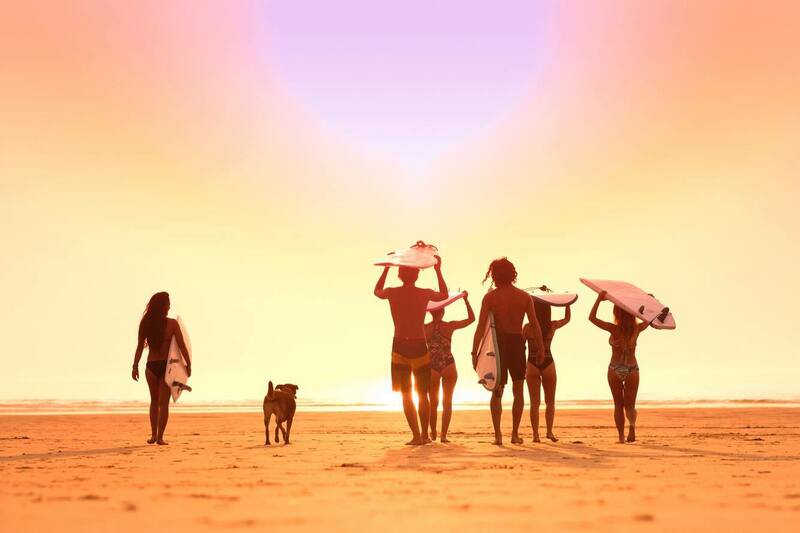 Just you and your friends on a classic surf session until sunset! Our certified surf instructors give daily tuition for beginners and intermediate surfers. 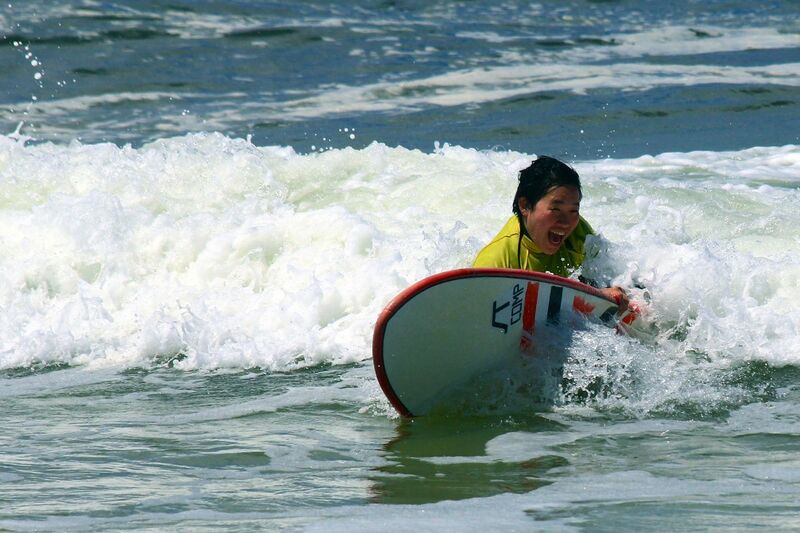 Surf lessons are held for about 90 minutes in the morning and 90 minutes in the afternoon in English and French. We provide all surf equipment adapted to our guests’ surfing skills, including more advanced boards for progressive surfers! We also provide guided surf tours (surfari pack) to the best surf spots around for more advanced surfers throughout the west coast of France. This is the only way to discover the best secret spots around because as all experienced surfers know, sandy bottoms shift all the time but we keep their track! SURFINN © 20-04-2019 05:05:54. ALL RIGHTS RESERVED.